KMC University’s Proven Documentation System addresses six aspects of documentation. Documentation requirements are often a frustrating fact of life for chiropractors. The rules and regulations seem to be an ever-changing, moving target. Practitioners need a reliable resource to depend on for up-to-date, easy-to-understand information about documentation. 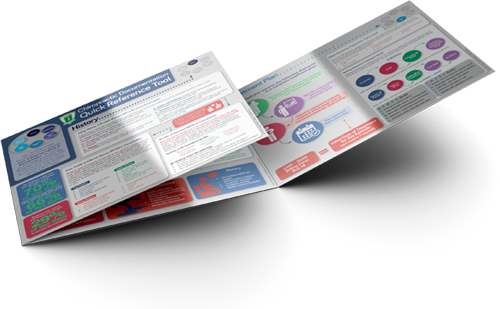 As certified, documentation experts, KMC University has put together this documentation quick reference tool as a go-to guide to the most important aspects of chiropractic documentation requirements for both initial and subsequent visits. History: Explore the four required components of a complete, compliant history for initial visits of episodes of care. Refer to individual pieces of history that must be included and simple ways to gather this data. Exam: The examination establishes the foundation for diagnosis and treatment. Follow quick guides on PART, radiology rationale, and other required elements. Diagnosis and Assessment: Initial visits require foundational essentials that must be included to establish medical necessity. Fundamentals captured on this tool include establishing co-morbidities and prognostic factors, as well as the best practices in the clinical diagnosis process. Treatment Plan: Believe it or not, every treatment plan must have four important components to be complete. This quick guide outlines these four required elements, and guides the user in an easy-to-follow process to ensure all are captured in your patient’s record. Quick-reference mnemonics are outlined for best practices in writing both short-term and long-term treatment goals. Daily Visits: Routine office visits, documented using the SOAP process, can pose particular difficulties when striving to prove ongoing medical necessity for care. This guide reviews key fundamentals to assist DCs with properly documenting both PART and SOAP for routine, daily visits. Specialty Visits and Discharge: Proper case management dictates that periodic re-evaluations and appropriate discharge from active treatment is essential. Follow the guide for quick tips on the components of a discharge summary, definitions of therapeutic withdrawal, and other crucial details essential for compliant documentation. A six-page, fold out tool, made of 100% recyclable, virtually-indestructible, waterproof, YUPO paper. Each page is 8.5 X 11 with fold-out panels walking the user through six aspects of KMC University’s proven documentation system.